Charlotte and Frankie are two best friends that are the epitome of normalcy. They spend their days lounging around, hanging with their friends, and going on a few short adventures. And this Christmas break, nothing is different, but they want to hilariously document their life in the short book of Nothing. Through this novel, we explore their ups and downs of friendship, the trials and tribulations of family, and what it means to be loyalty. Yet, the boring lifestyle of these two friends is what truly makes it the book of Nothing. I had originally picked up this book because of how normal it sounded; there were no huge plot twists, simply the life of a modern teenager. Going into this, I expected it to be still somewhat engaging, but I’m very on the fence with that statement after reading the story. As a child, I used to read the Ivy + Bean books that Annie Barrows wrote. However, I felt that those types of childlike language translated here and furthered my confusion. The point of view of the story kept switching, so I was constantly scratching my head at who was talking and for what purpose. I found the book a little too boring for my taste. Perhaps that was the intention of the story, but I don’t think that many teens would be too interested in this type of genre. However, I encourage anyone to still take a shot. This book didn’t mesh with me, but maybe it will for others. 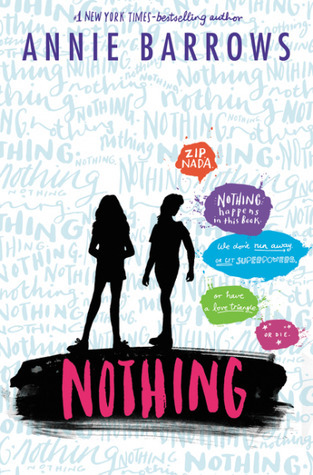 I enjoyed that this book showed that friendships aren’t as perfect as people try to make it out to be. Frankie and Charlotte were best friends, but they still fought and pushed each other harder than they wanted to be pushed. Yet, in the end, they still had each other’s backs, which is what true friendship is about.